Pink MagaLine: Join the 40 for 40 Giveaway! Join the 40 for 40 Giveaway! Hello ladies! How's your Wednesday morning? I just want to spread the news about this awesome giveaway. Cherry dear is hosting a 40 for 40 birthday giveaway where you can have a chance to win over $500 worth of cash and products. 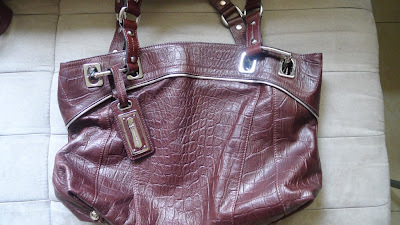 There's $40 worth of cash, a Rollei Camera, B.Makowsky satchel (photo above), H&M accessories and Sasa products at stake. Her giveaway is open until the end of the month, so join now! Planking. More fun in the Philippines.